Last summer I traveled down to the 6th Grade AAU Nationals in search of the next big prospect. I heard about this kid from 916 Select out of California and felt I needed to check him out. Once I saw Marvin Bagley III play I know my journey was complete. The developing small forward passed the look test standing 6’5 and the skill test when I watched him perform. 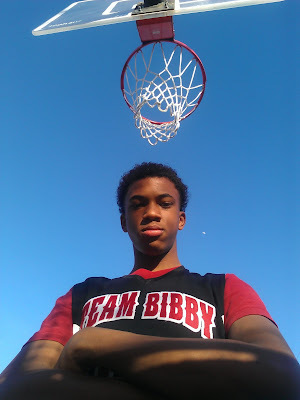 After the tournament he appeared at the top of several ranking list for the Class of 2018. Marvin currently plays for We All Can Go All Stars and Team Bibby. We contacted Marvin to see what was going on and this is what he said. BS: What are your basketball goals for the season? MB3: To become a better player than I was last year. I also want to win an AAU National Championship. MB3: It’s hard to choose just one favorite player because I like so many. If I had to narrow it down, my two favorites would be Kevin Durant & Blake Griffin. I like Kevin Durant because he can score in so many ways, and Blake Griffin because he’s an unbelievable dunker. BS: What is the strongest aspect of your game? MB3: My work ethic is the strongest aspect of my game. I enjoy working on being a better basketball player. BS: What aspect of your game needs the most improvement? MB3: I would have to say I need to not be so hard on myself. Sometimes I may expect too much from myself. BS: What was your fondest basketball moment? MB3: When I dunked a rebound in Portland, Oregon and the basket broke. After the dunk, the hydraulics failed and the rim dropped to the floor. After a short delay, the basket was fixed and the game resumed. BS: What’s your dream college and why? MB3: My favorite college team is Arizona State University, because my grandpa played there in the 1960’s and his #32 jersey was retired there. However, I’m not sure what college I want to attend when the time comes. BS: Who is the toughest opponent you ever faced? MB3: My dad is the toughest opponent I ever faced on the basketball court. It’s always really tough when I play him one on one. BS: How do you deal with the pressure of being ranked the #1 player in the class? MB3: I try not to think about rankings, because it’s just a matter of different opinions. I was taught that people can love the way you play today and hate the way you play tomorrow. I don’t feel pressure about rankings. The only pressure I feel is from myself, and it’s when I push myself to get better. BS: If you could have dinner with one person, who would you select and why? MB3: I would want to have dinner with Michael Jordan, because he’s the best ever and I would love to hear advice from him directly to me about how I could become the best ever.